The 1984 sci-fi film, Starman tells the story of an alien who travels to Earth after intercepting the Voyager 2 space probe. Affixed to the probe is a gold phonograph record with a message of peace for all worlds and an invitation for the inhabitants of other galaxies to visit Earth. Arriving here in the form of a blue mass, the alien is shot down by the US government over rural Wisconsin. In order to survive, the alien uses a lock of hair to clone and then take on the form of a recently deceased man named Scott Hayden (played by Jeff Bridges). 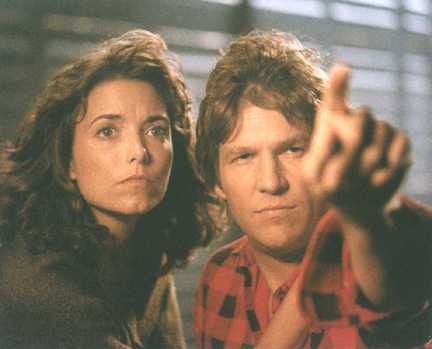 After taking on Scott’s body, “Starman”—as he comes to be called—enters the house formerly shared by Scott and his widow, Jenny (played by Karen Allen). Finding this naked man standing in her living room, Jenny mistakes him for an intruder and pulls her gun on him. When he turns around, Jenny is astonished to see a man who looks and moves exactly like her deceased husband. However, as soon he begins to speak, Jenny instantly realizes that this is not Scott, and she’s not sure who (or even what) he is. She promptly faints in the corner—a moment of necessary comic relief in an intensely escalating scene. Neither Starman’s appearance nor his initial mannerisms give him away. But as soon as he begins to speak, it becomes clear that he is different, strange, alien. Jenny soon comes to realize that he is from above—a stranger from the heavens—and that his mission is now to return safely to the place from which he came. The story of the Starman shares many similarities with John’s presentation of Jesus. In like manner, Jesus has come from above (1:1-2) and taken on human flesh (1:14). His mission is to complete the tasks assigned to him by the Father and return to the place from which he came. Like the Starman, when Jesus speaks he introduces alien concepts and utters enigmatic sayings that are all-too-often misunderstood by his audiences, who presume he is from Galilee (e.g., 7:52), and find his words difficult to accept (e.g., 6:60-66; 10:31-33). This Jesus is not the gritty, earthy, Synoptic preacher of parables from rural Galilee. He is rather a stranger from heaven, who consistently speaks about the things above while mystifying his hearers.